Also on the 1st day of April, we dropped the final “Volcanic Dreams” part of the Aloha Jam series by Bobby Carter over at Diversion TV! Bobby always brings new ideas and videos that enhance our culture, thank you Bobby! St Martin head honcho’s Alain and Manu Massbova made the trip from Paris, France to LA, California to ride with legends Chase Gouin, Jesse Puente, Ahmed Johnson, Bobby Carter and many others, with riding footage shot at the SM jam in Newport Beach, enjoy this great edit from JC Pieri that we published on the 3rd. On the 4th, we featured a tight new promo with rolling master, Phil Dolan for the up and coming Ground Control UK contests in May. On the 5th, I published an Awesome new edit out of Gurvan Le Bloc’h filmed this past weekend in Brest, Brittany France. Look out for the spinning gerator foot straddled over the head tube foot on bar no handed (got to be a shorter description than that?) and much more! Keep an eye out on this kid! On the 9th, the first Must Watch edit of April! George Manos continues to push the pegless direction in his riding to new levels in his new “Dayrkness” edit. I’m bit late posting this as Vimeo was down last night, standouts for me after a few watches are a couple things I have never seen before. A lot of the combos George is doing have no name other than perhaps what he might call them, I’m several watches in right now and still hitting the rewind on the pegless whiplash at 00:12, and combos with amazing foot to tyre switches technique at 00:51, 1;06 stood out to me! Great to see pushing George continue to pushing pegless riding to new heights, 100% originality right here, and so much style too! A day later, and another treat with the Buoyancy crew filmed by mmfilms, featuring Shuichi Osada, Akihiko Takahashi, Naoki Watanabe, Hiroki Iwata and Takumi Matumoto, deep in the japanese countryside. April 10th, If you know James McGraw you will know it’s uber hard for him not to post every combo he does on social media. He bucked that trend working on his 46th birthday edit and it doesn’t disappoint as James continues to progress his back wheel riding. Long may this continue, inspirational edit! 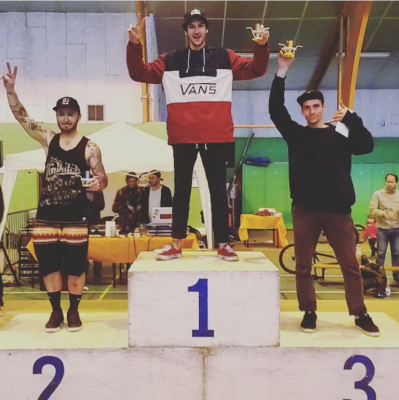 Congratulations to Matthias Dandois who just took the win at the annual Astrolabe contest, followed on the podium by Alex Jumelin and Quentin Pelorson. Photo credit: Stephane Bar. On April 14th, and time for another Must Watch! This time just a clip, but wow what a banger from Jason Plourde! I had been waiting to see Jason Plourde get this done for a while, and this upside down decade to xft ice cream is absolutely spot on! Amazing! Half way through the month, and we published a great feel good edit from the 2016 Chiba Cup, great riding from the likes of Moto Sasaki, Shuichi Osada, Masashi Itani, Takuya Higa, Takahiro Enoki, and many more. On the 16th, the second Must Watch clip of the month! I’ve said it many times, but flatland really is perfect! And when you see tricks like this that do not even seem real, it inspires everyone! Thank you Martti, incredible creativity, skill and balance to get this done! Big up all the entries for Master of Creativity that inspired this move to happen. April 18th was a good day! Part 1 of the 3 part Ride On interview with flatland legend James White just dropped. In this first part, Neil Waddington catches up with James to talk about his origins in BMX and his riding throughout the 80’s and 90’s. Pure gold! On April 19th, Some big sponsorship news from Japan, Takuya Higa just signed with Deco on board a jackpot. 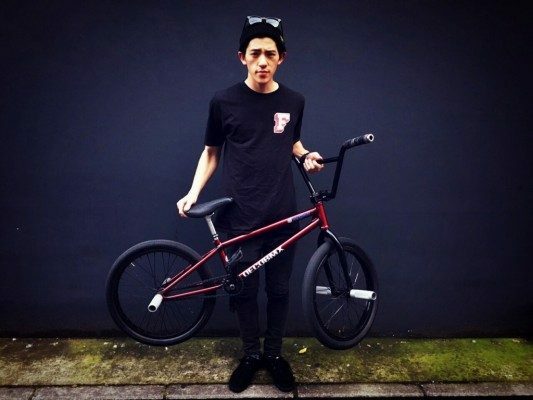 Congratulations on the well deserved hook up Takuya! On the 19th, The stylish Forkone just dropped this Martti Kuoppa inspired “Stemland” edit, really like the double boomerang to stem lash at 00:30 and there’s much more! Hit play! Also on the 19th, what turned out to be a rare treat from Dane Beardsley just dropped this awesome “Early 2016” part with plenty of goodness to get your teeth into. As always Dane’s combos are really well thought out and executed perfectly, couple of the highlights for me: 00:25 – the xft whiplash to xft hitch xft forward karl one kick turbine whip to xft backwards hitch whip and shove-it to regular hitch xft smoothie out, and the standout for me although I’ve seen Dane do it before it still gets me every time: steam jump over bars to two footed backyard line at the 1:00 minute mark is beautiful and so hard. Definitely worth a watch, hell yes Dane! 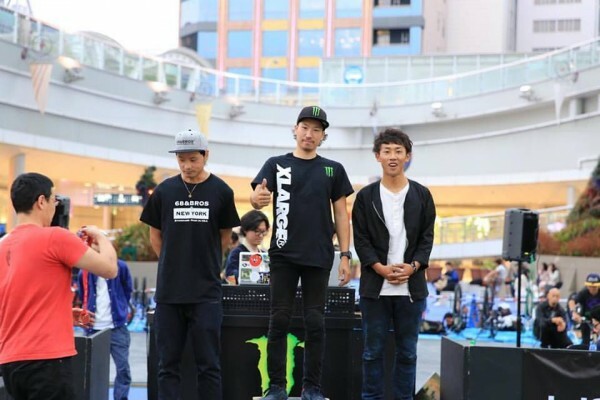 On the 24th, Moto Sasaki took the win yesterday at King of Ground Round 1 in Nagoya, Japan followed on the podium by Bekko and Takahiro Ito in third place. On the 27th, Part 2 of the James White Ride On Interview series just dropped and is absolutely golden. Once again great job from Neil Waddington. Hit play for some great Whitey footage plus his thoughts on the X Games dropping flatland, Level Vibes, Flatland Image, London Bikes, and perhaps the funniest question about James being in Phil Dolan’s shadow. I almost dropped my tea laughing at this the first time round, fantastic stuff right here! On the 30th, the month ended with some intense battle footage from Amsterdam. Dominik Nekolny took the win at the Soulcycle Championships in Amsterdam, followed on the podium by Dez Maarsen, David Hoffmann. Sietse Van Berkel and Gilles Van Sompel took the 4th and 5th spots. Worth watching this again!